This is a website for Tore Sunde-Rasmussen. About what he is doing and what he has done. Tore has a love for nature and tries to fulfill some of his dreams in life. So far he has been successful. He is the oldest scandinavian who has been on the top of Mount Everest 8848m. the highest mountain in the world. He is also, so far, the 5. person in Norway who has completed all the 7-summits. The highest mountain in all the worlds seven continents. In addition to this he also scaled Mt. Kusciuszko, the highest top in Australia, to add this one as no. 8 to his list. - he was the first Norwegian to summit both from north and south. 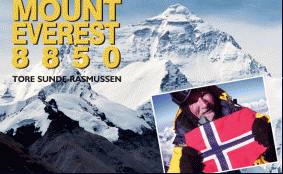 -he was the oldest Norwegian and scandinavian who has summited Everest. Be friend with Tore on facebook. Tore holds lectures about motivation and how to reach and fulfill ones dreams and goals. The lectures can be held for companies, organisations, kick-offs, etc. He uses his own experience from the mountains together with amazing pictures showing his climbing all over the world. years, and is also member of the Norwegian Black-belt grading committee. Tore is Branch Chief for Shin- Kyokushin in Norway. He welcomes people from all over the world to be guided in the Norwegian nature. 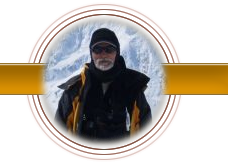 He offer a full range of activities from beginners to the very experienced and further to the possibility of advanced climbing.